Overwrought, unsatisfying storytelling takes the shine off a gorgeous and ambitious finale. A confused and confusing mess of terrible storytelling, simple action, and endless fan service that will delight existing players but baffle new ones. Kingdom Hearts 3's impenetrable lore doesn't stop the last chapter of Sora's story from being a fun frolic through beloved Disney worlds. Good news: it’s not the worst game ever made. Not by a long shot. It just has a lot of baggage. For all the new in Kingdom Hearts 3, there is plenty of the old too. The action combat is more satisfying than it's ever been, even if it's a tad easy to skate through the main storyline. For longtime fans of the series, all those emotional payoffs that have been building for 17 years await. For newcomers, buckle up: because you're in for a wild ride of bonkers Disney interactions and some exciting boss battles. Kingdom Hearts III might not be the best final entry possible (and knowing this series, a "Final" mix of the "final game" is easily an option), but I'll dearly miss Sora and his friends. Despite all of the absurd twists and turns, the character missteps and the complete lack of some series-defining cast members, there are very few creations out there that make me smile this often. This is it, the epic, emotional and satisfying conclusion to one of gaming most beloved series. Kingdom Hearts III is everything we could had hoped for (and even more), but it's biggest achievement is that, even by today's standards, it's a one of a kind experience that can only be described using one word: magic. Overall, Kingdom Hearts III is a very involved game, both functionally and narratively, but on each count, these aspects of the game can be awkward and difficult to fully understand, especially for newcomers. If you are one of the many people that have waited patiently for this installment and the chance to stick it to Xehanort, then you will definitely enjoy yourself a great deal. Kingdom Hearts III is an absolute triumph, conquering the darkness that plagued the series' past and standing firmly in the light. It's not just a great Kingdom Hearts game, it may very well be a game that gets revisited in December. 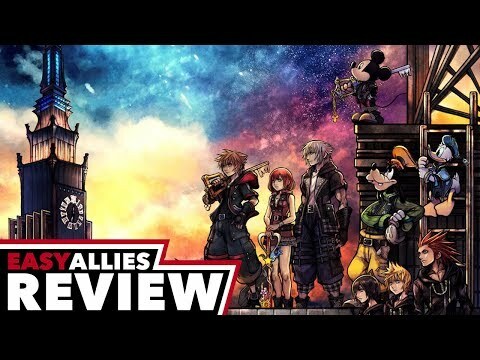 Kingdom Hearts 3 offers a fascinating adventure with some stunning optics that offer absolute fun when playing it but the plot is slow and does not live up to the level of noise the game has created. Kingdom Hearts III has the magic you are waiting for. Square Enix has achieved the best episode of the series. Sora, Donald and Goofy are now very fast and take you through a lot of endearing experiences and characters. His script continues to have problems but everything else is a memory that will stay forever. Visually stunning, Kingdom Hearts III it's all about being cool while delivering us the best conclusion for a long-time series. Kingdom Hearts 3 has been a long time coming, leading some fans to wonder if it would ever finally get there. The long wait proved to be well worth it though, with a satisfying ending they've been wanting for years, while also managing to setup the future of the franchise as well. The final game in the series goes out with more of a whimper than a bang, but there's still plenty of heart, and the combat never fails to entertain. There're some wonderful visuals and plenty of Disney surprises, and although the story is a mess when it strays into the series' lore, it's still fun.